I have been searching the delete bins at the $1.00 stores in Toronto, Canada, for old Blood and Bubble movies. Bad movies, like everything else, suffer from the laws of diminishing returns. I have cleaned out the local $1 stores and it is unlikely that they will be restocking any month soon. So, I have moved up in the world, and this morning checked out a Toronto Twoonie Store. They are just like the Dollar Stores, except their junk is higher quality and sells for twice as much ... a twonie (A twoonie in Canada is a $2 coin). 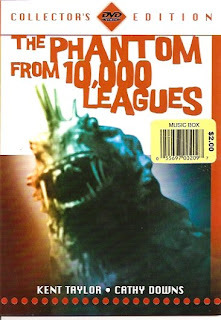 I did find a recent DVD scan of a Black and White drive-in B movie from 1956 called The Phantom From 10,000 Leagues. I saw it years ago in the Eganville Theatre on one of their infamous 5-horror-movies-for-the-price-of-one that they used to hold a couple of times every summer. It was bad back then, and, now on DVD it is even worse. But, for divers, there are a couple of underwater howlers that can't be missed. I worked up a listing for my book, and here is an extended version of that entry. Director: Dan Milner. Starring: Kent Taylor, Cathy Downs, Michael Whalen and Rodney Bell. Diving in the dark fresh waters of the Province of Ontario, one often wishes for a light source more powerful than Halogen lights. In THE PHANTOM FROM 10,000 LEAGUES, scientists working in the Pacific Ocean use a light that could cut through even the murky dirty waters of Lake Erie -- introducing the Underwater Atomic Light. This nuclear powered device whacks out so many foot-candles of light that it mutates creatures living on the bottom of the sea. The atomic torch is the brightest light in this dim effort (made even worse by a very dark scan for the DVD). Divers will love/hat what few underwater scenes are shown in the film -- they are so bad you just can't miss them! What makes this picture special, in a mediocre sort of way, is that it was one half of the world’s first prepackaged double bill. The THE PHANTOM FROM 10,000 LEAGUES was paired with the Day the World Ended and sold to theatres on a two-for-one basis. Although difficult to market in the beginning, this marketing concept, aimed squarely at the drive-in crowd soon gained acceptance. Double Bills became a stable for the next 20 years thanks to this flick. The THE PHANTOM FROM 10,000 LEAGUES is still being shown on late late late-night TV. Blood ‘N’ Bubble fans should know just by looking at the title that this is a movie that doesn’t understand anything about the business of going underwater. 10,000 leagues is about 30,000 miles, however Planet Earth is only 8,000 miles in diameter. That means that the mutated alligator thingee that harasses divers and eats swimmers would have to be 22,000 miles out into space to be truly 10,000 Leagues down! The action takes place along a lonely stretch of the Pacific Ocean, presumably somewhere in southern California. A scientist has a seaside lab where he is conducting a number of secret experiments that involve the Atomic Light, and a weird creature that now prowls the waters near a fissure that has mysteriously punched through the ocean floor. The beast sinks an ocean going freighter, drags a few swimmers to their death and somehow attracts the attention of Federal US secret agents. There is a mad professor, his fetching daughter, international spies and a mother who wants revenge against after her son is killed by the Beast. Made before many movie goers knew anything about diving, the film makers took many liberties with the business of going underwater. The general public didn't notice the on-screen gaffs, but, divers were left rolling in the aisles and honking their horns in derision at the local Drive-In. So, what was so funny about the dive scenes? Well, for starters the movie is suppose to be set in the chilly kelp beds of the Pacific Ocean. A variety of people, many of them victims for beast, make on-screen dives in the movie. Every diver shown wears nothing but a swim suit, tank, double house regulator, flippers and weight belt. Men and women alike enter the water without benefit of a wet suit or gloves and are able to stay underwater for long periods of time without ever getting cold. The only protection that everyone of them wore underwater was a variety of bathing caps ... probably more to hide the fact that stunt doubles were being used to handle the subsurface scenes than to offer any warmth to the actors. Other scuba gaffes? Well, there are times when the Pacific Ocean can be flat, but ... in THE PHANTOM FROM 10,000 LEAGUES both the on-water and underwaer scenes are obviously shot inland in a lake. Divers routinely take a tiny rowboat out to sea and magically find the monster's layer without benefit of compass, radar or even a floating marker. The boat is too small to carry an anchor so the divers simply bail out of their boat (the same row boat is used in all dive scenes even though it is once burned by nuclear gook from the Beast and scuttled by the Beast in another) without dropping anchor. Leaving a 10ft rowboat untended and floating supposedly on the open seas, the divers are able to swim long distances underwater, be chased by a monster and still find their rowboat exactly where they left it. The underwater scenes with the Beast appear to have been filmed inside a tank. The camera work is actually quite good. Unfortunately the water inside the set is so clear we can clearily see how cheesy the Beast actually is (It's costume looks like a reject from the Mummer's Parade). The Phatom would have looked better shot from afar ... say 10,000 Leagues down.